The first and most essential piece of gear for traveling light is a good backpack. 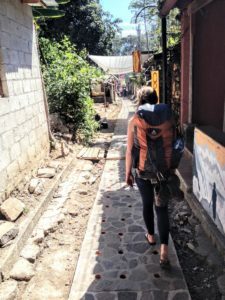 You want a pack that is big enough to fit everything you need, but not so big that it exceeds carry-on requirements or feely bulky when walking around. Enter the Osprey Farpoint 40 Travel Backpack. The Farpoint is incredibly spacious and includes great pockets that make staying organized on the road a breeze. It also comes with an awesome removable day-pack that gives you the flexibility to take only what you need on your daily adventures. Let’s say you’re all set for your next big trip. You’ve booked the flight, reserved the Airbnb, and arranged your ride to the airport. Your only problem is that you can’t seem to fit everything you need inside your bag. Compression packing cubes solve this problem by compressing your clothes down to a fraction of their original size, allowing you to fit everything you need. Our favorite are the Eagle Creek Pack It Specter set. Not only do they reduce the size of your bag, but they’re also great for staying organized and keeping dirty clothes separate in your bag! Nothing is worse than touching down in a new city only to see the ‘low-battery’ warning pop-up on your phone. If you’ve got to catch the train to your hotel and don’t remember the address, a dead smartphone is a major problem. The Anker Power Core charges an iPhone up to 7 times, ensuring that you’ll still have plenty of battery even after that long bus ride. A big, fluffy towel is the enemy of a small travel bag. A musty wet one at the bottom of your backpack is even worse. Travel towels are light, can absorb huge amounts of water, and dry much faster than traditional cotton. They also pack down nearly flat, saving valuable space in your bag. Our favorite is the Sea to Summit DryLite Travel Towel. ExOfficio’s line of packable, quick-dry underwear is truly one of our travel favorites. It weighs next to nothing, can be easily washed in a bathroom sink, and dries incredibly quickly. Plus, it’s so comfortable that we find ourselves wearing it even when we’re not traveling! You can check out the Women’s Give-n-Go here and the Men’s version here.